As a child, I never liked Rice Crispy Treats - or as they're commonly known in Australia, LCM Bars. They were too sticky, too sweet, too sickly, too eugh. One summer I was hit with the urge to bake, only to be told by my Mum "Kristy... don't turn the oven on - it's too hot". I wracked my brain and decided I needed to make a no-bake treat. This was when I first created my peanut butter rice crispy treats. In addition to being a lot healthier, they weren't sticky, weren't sickly sweet and I actually LOVED them - success! 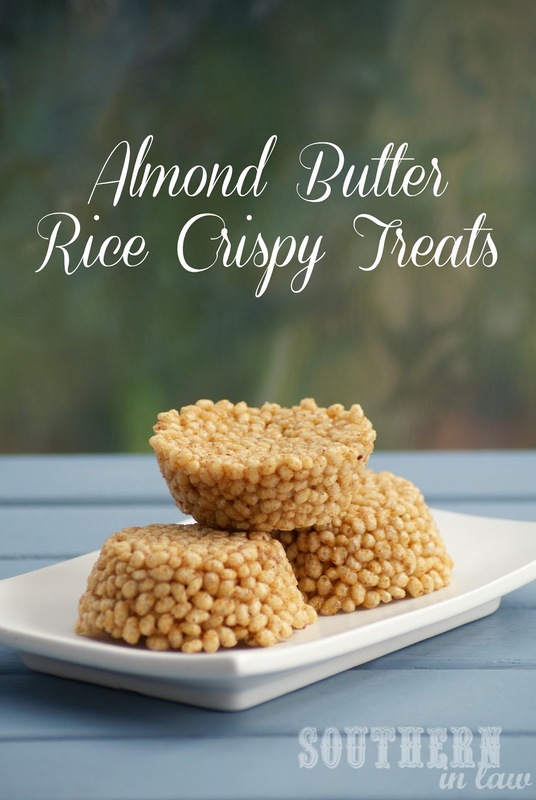 These Honey Almond Butter Rice Crispy Treats are incredible. 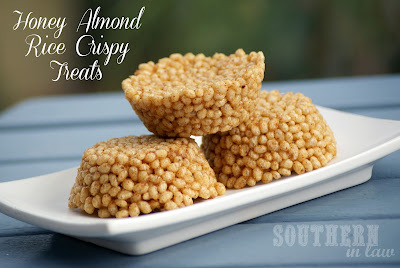 Even Jesse who hates Rice Crispy Treats loved these - and he didn't even want to try them to begin with! I made one double batch and within a few days they had all disappeared! I like to keep them in the freezer so they're really hard and chewy, but Jesse likes them at room temperature or in the fridge - so see what you like best! Line a small cake/loaf tin with baking paper or use silicone muffin cups. Combine all of your ingredients until all of your cereal is coated. Pack your mixture into your tin/cups, pressing down quite firmly to get the mixture to stick together. Place in the fridge or freezer to chill until firm. How easy is that?! And delicious! But tell me, what was your favourite childhood treat? These look awesome! I love that they are only 3 ingredients, perfect! When I was little (food allergy free and actually not vegan) my mom would surprise me and my brother with Funfetti cupcakes and lemonade on random days during the year. They're so easy but so delicious! My sister is desperate to try funfetti cupcakes since Jesse told them about them - so we're going to get his best friend to bring over a box so she can try them haha. I used to LOVE fresh lemonade - and even bought a lemon tree in the hope of having beautiful home grown lemons for lemonade. Apparently the lemon tree knew something I didn't because it never grew lemons - and I actually found out I couldn't eat lemons just a couple of months after buying the tree!